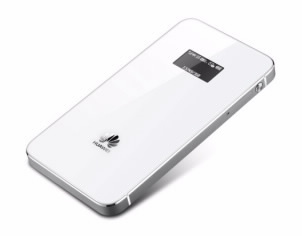 Huawei has unveiled a mobile WiFi hotspot device- Prime E5878 that delivers download speeds of up to 150 Mbps and connectivity for up to 10 devices with a range of 100 meters. The mobile WiFi device with OLED screen display that runs on HiSilicon A9 dual-core chipset and LTE Cat4 connectivity. It is 7.5mm thick and measure 109.5mm long and 58mm wide. The Prime E5878 according to Huawei, uses Nano Molding Technology (NMT), which combines metal with polymer into a seamless material thereby making it slim. Huawei Prime also incorporates symmetrical dual lenses for its OLED screen, which in addition to being scratch and crack resistant, are integrated seamlessly with the metal to present a dazzling, polished feel. Huawei added that Prime is able to stay online for up to 8 hours of use in LTE mode or 380 hours of standby time, provided by 1900 mAh powered battery. In addition, the device can be controlled remotely by a smartphone using the ‘Huawei Mobile WiFi’ application available to download via major app stores. Available in white and black, it will hit markets in Europe, Middle East soon. Customized versions including sunny gold, peach pink or turquoise green, with polka dot or diamond texture effects, will also be available in selected markets.